Goya Bitter Orange, 100% Seville bitter orange concentrate and pulp, is ideal for marinating pork, beef and chicken. To season your meats start with 1 cup of Goya Bitter Orange and season with Goya Adobo - then cook as you usually would. Enjoy! If it is Goya, it has to be good! Ingredients: Water, orange juice concentrate, citric acid, orange essence, seville orange oil, grapefruit extract, preservatives: 1/20th of 1% potassium sorbate, 1/20th of 1% sodium benzoate & 1/20th of 1% sodium metabisulfite, 1/20th of 1% potassium metabisulfite, E.D.T.A. ). 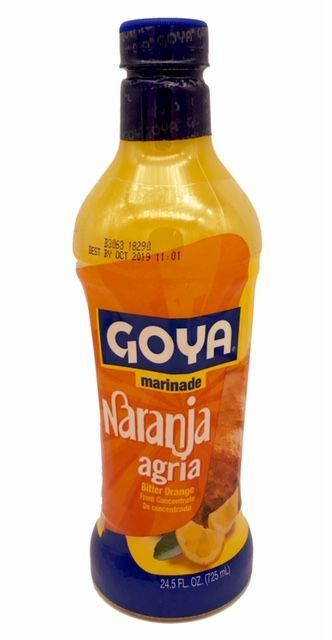 Naranja Agria Goya, pulpa y concentrado de jugo de naranja agria 100% Sevillana, es ideal para marinar cerdo, carne y pollo. Para preparar sus carnes empiece con una taza de Naranja Agria Goya y condimente con Adobo Goya - despues cocine como lo haria usualmente. Disfrute!Si es bueno, tiene que ser Goya! Ingredientes: Agua, concentrado de jugo de naranja, acido citrico, esencia de naranja sevillana, extracto de toronja, conservantes: 1/20th de 1% benzoato de sodio y 1/20th de 1% metabisulfito de sodio, 1/20th de 1% metabisulfito de potasio, E.D.T.A. This is an indispensible ingredient in Yucatan cuisine, especially for marinating pork. The Goya brand does not contain salt, which is nice as you can control that yourself. It really isn't bitter, by the way, just nice and acidic. You could probably also use it in ceviches or in salad dressings.